When I was a kid, counting down to Christmas was a big thing! We’d make paper chains… you know, just in case the Advent calendar was wrong. Now that I’m a grownup, I count down to vacation, kids coming home from college, the next payday! The super-obsessed (I’m not quite there yet) even download countdown apps to their phones! The friendly people of Stillwater, Oklahoma might just be the most countdown obsessed there is! The city’s pride and joy (not the Oklahoma State Cowboys, though they come in a close second) is Eskimo Joe’s… a bar, restaurant, retail establishment and all-around-good-guy-owned-cornerstone-of-the-community. 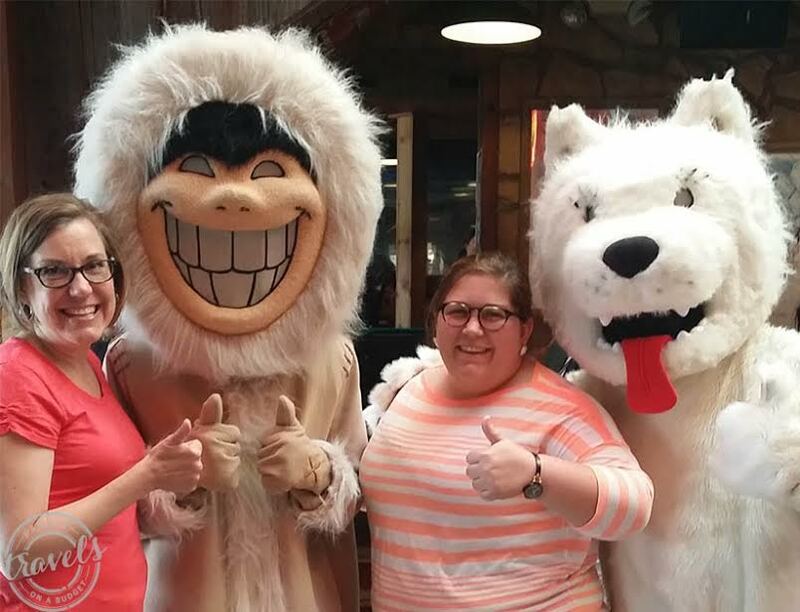 Every July, Eskimo Joe’s holds an anniversary bash. It’s grown through the years, as good things often do. 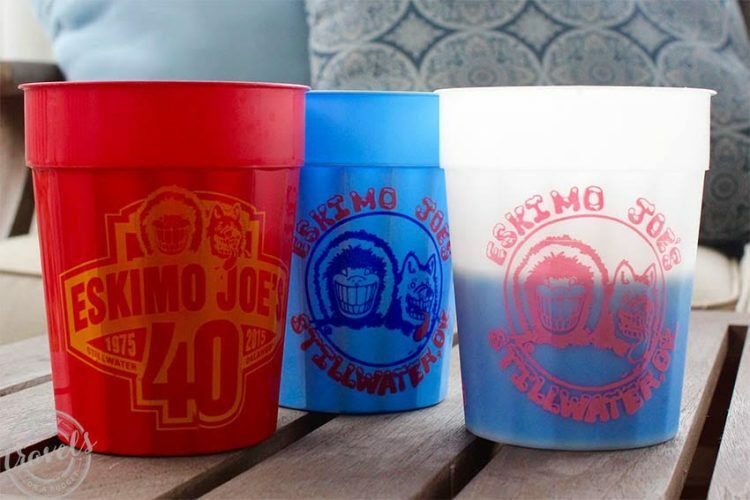 This year, from July 20-26, Eskimo Joe’s will celebrate 40 years in Stillwater! And they’ve been counting down since the moment last year’s celebration ended ~ that’s about 360 days spent counting down and 7 spent celebrating. It has to be good! What? You never heard of Eskimo Joe’s? Well, that’s a shame! Okay, just kidding… kind of. Eskimo Joe’s began as a small campus bar in an old building way back in 1975. In 1984, when the legal drinking age was raised to 21, Stan Clark (owner and incredibly kind-hearted mastermind) decided that to stay afloat, he needed to make Eskimo Joe’s a restaurant. And that’s it. Really! Eskimo Joe’s celebrates its anniversary with a street party that draws locals, foodies from across the country, and lots of OSU alums. It’s the very best of semi-small-town tradition! 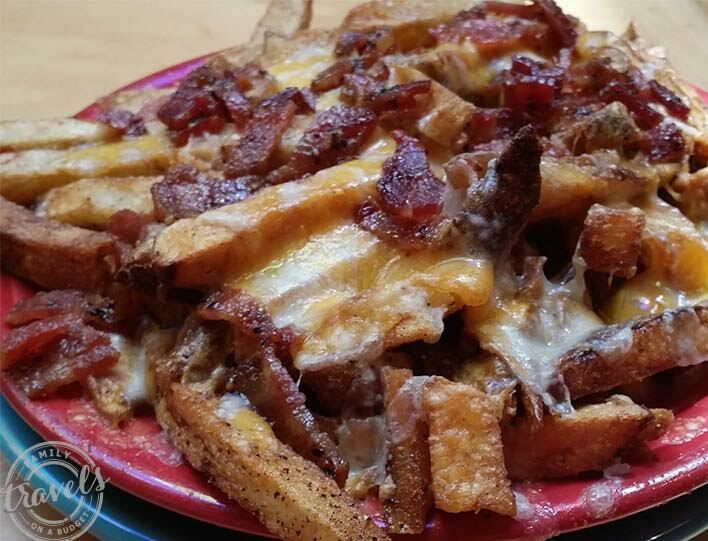 Eskimo Joe’s cheese fries are the most famous item on their menu. I’ll be honest, I was skeptical… But when in Stillwater, eat like a Cowboy. Right? According to locals, THE BEST cheese fries are the “Sweet Pepper Bacon Cheese Fries.” Two orders were brought to our table of 8. They didn’t last long… minutes, tops! They were sooooooo good. Hand-Cut potato fries, crispy on the outside and soft on the inside, loaded with cheese and extra-flavorful bacon… can you taste it? I think former President George H. W. Bush was a smart man to endorse these fries when he spoke at OSU. 🙂 No brainer there, Mr. President! Besides the fries, you just have to order a non-alcoholic beverage at Eskimo Joe’s. That’s another no-brainer. Non-alcoholic beverages come to the table in Eskimo Joe’s labeled plastic cups. They’re a big deal. A really, really big deal! Stillwater natives use the cups for everything — and have developed a measuring system using the cups. Every local we met told of cupboards stacked high with Eskimo Joe’s cups. We joined the craze — and got particularly excited about the color changing cups! Oh yeah. My kids have not been to Eskimo Joe’s (yet) and they’re still obsessed with these cups! I usually call dibs to save them from themselves. It’s a silly little thing, perhaps, but these branded cups are really fun! Eskimo Joe’s classic t-shirts feature Eskimo Joe and his sidekick, Buffy. Over lunch, Stan told us how Bill Thompson, at the time a freshman commercial art student at OSU, sat at a table in the corner and drew the logo in about an hour with a magic marker. It’s been the logo ever since! In today’s world, corporate greed and growth go hand in hand. Stan Clark is not that man. He is passionate about his company, but more, he is passionate about Stillwater. He loves his hometown and doesn’t need a national franchise to feel successful. Of course that means you can only get those cheese fries in one city! Watching the staff, many of whom had parents who worked there when they were in college, it is obvious that working at Eskimo Joe’s is fun. Stan Clark knows many of the staff by name. He knows what’s going on in their lives. He pays his bill and he tips the servers. I saw the heart of this man and realized that Eskimo Joe’s IS the icon it is not because of his brilliance as a businessman, but because of his heart as a human. He cares about Stillwater. He loves OSU. He respects his staff. And the result is no surprise! Well, what are you waiting for? Start your countdown to Stillwater. Save some fries for me! 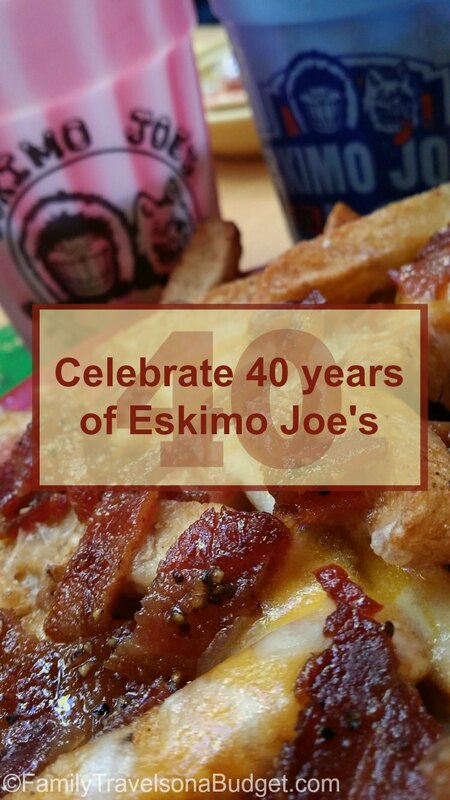 Happy 40th Anniversary, Eskimo Joe’s and Stan!